Results of many-year-long studies of high-power quasi-stationary acceleration and compression systems whose channel is a magnetoplasma analogue of the Laval nozzle are summarized. Double-stage quasi-stationary plasma accelerators with channels made of rod electrodes or complicated magnetoplasma transformers are described. Results are presented from experimental studies of acceleration and compression systems. 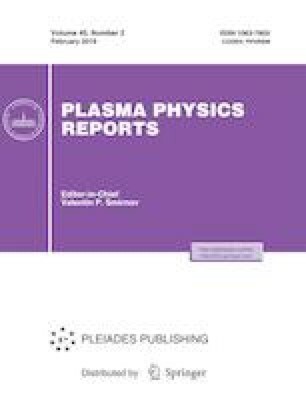 It is shown that, in the optimal operating regime corresponding to the proper choice of the initial and boundary conditions, plasmadynamic devices are able to generate plasma streams with parameters close to the theoretical limit for given experimental conditions. A unique set of parameters of the generated streams were achieved: the density of the accelerated stream of up to 1016 cm–3 at a maximum velocity of (4–4.2) × 107 cm/s and the density of the compressed stream of up to 1019 cm–3 at a plasma temperature of 60–100 eV. The total energy content in the accelerated plasma streams reaches 0.9–0.95 MJ at an accelerating channel efficiency of 0.8–0.9. The generation time of accelerated stream amounts to 150–200 particle flight times along the channel of the plasmadynamic device, while the lifetime of the compression region reaches 20–30 particle flight times.